Blue Origin founder Jeff Bezos stands near his firm's New Shepard rocket before its maiden voyage. Blue Origin launched the same rocket and crew capsule on its third test flight, which included a successful landing in West Texas, on April 2, 2016. Billionaire Jeff Bezos' private spaceflight company Blue Origin launched a prototype reusable rocket into space and then landed it back on Earth on today (April 2) in an epic third successful test flight in less than five months. During today's unmanned test, Blue Origin's New Shepard rocket and capsule launched into suborbital space from the company's West Texas test site, its proving ground for reusable boosters. The capsule separated in space and returned to Earth via a parachute, while the New Shepard rocket descended on a plume of fire to stick its third vertical landing. Blue Origin captured this jaw-dropping video of the reusable rocket test , with views from both the ground and air. Blue Origin founder Jeff Bezos tweeted a photo of Gradatim Ferociter boots that he wore to today's launch, which he says brought him luck as the unmanned, reusable rocket rose and returned to Earth. Bezos wore a pair of custom cowboy boots emblazoned with Blue Origin's motto "Gradatum Ferociter" (Step by Step, Ferociously) during the launch. The billionaire wrote on Twitter that the boots, a gift from a friend, brought good luck for the flight. Saturday's test flight — which Bezos announced via Twitter on Friday (April 1) — marked the third vertical launch and landing demonstration by Blue Origin's New Shepard rocket and capsule since the booster made its first successful vertical landing on Nov. 23, 2015. The rocket made another successful landing on Jan. 22. Blue Origin plans to use New Shepard and its capsule to launch paying passengers on trips into space, though the company has not yet announced how much such space tourism flights will cost. The New Shepard rocket and capsule can carry up to six people into space, but not high enough to reach orbit. The suborbital capsule is capable of flying higher than the 62-mile (100 kilometers) boundary between Earth and space, then descends and lands via parachute. After separating from the capsule, the booster uses its thrusters to descend vertically onto a landing pad, where it sets down gently enough to be reused in later launches. 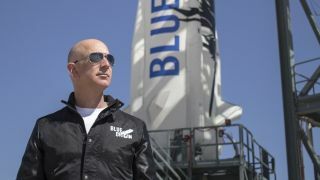 In his Friday Twitter posts announcing Saturday's launch, Bezos promised what appeared to be the most ambitious test flight yet for New Shepard and Blue Origin. The flight, Bezos promised, would be "pushing the envelope" with New Shepard restarting its BE-3 rocket engine just 3,600 feet (1,097 meters) above the ground during its landing. "Impact in 6 [seconds] if engine doesn't restart & ramp fast," Bezos wrote. Blue Origin engineers ready the Crew Capsule for launch ahead of New Shepard's third unmanned flight test from West Texas on April 2, 2016. Blue Origin also packed two science experiments onboard the Crew Capsule during the test flight. One experiment, called the "Box of Rocks" Experiment," was exactly like it sounds: a box of rocks launched into space to observe how the rocks move in weightlessness. The experiment was designed by researchers at the Southwest Research Institute to understand how rocky soil on small asteroids moves. The second experiment, called the Collisions in Dust Experiment, was created by researchers at the University of Central Florida. It included a marble that would be dropped into a bed of dust to study how collisions between particles in the early solar system worked. By developing a reusable rocket, Blue Origin hopes to lower dramatically the cost of its launches. The company in not alone in this pursuit. Its competitor SpaceX, founded by billionaire entrepreneur Elon Musk, is also pursuing reusable rocket technology for its Falcon 9 rockets. In December, SpaceX landed the first stage of its orbital Falcon 9 rocket on land, becoming the first entity ever to accomplish this feat during an orbital launch; the company has also made several nearly successful tries to land the booster on an ocean platform. SpaceX, however, has not yet reused a Falcon 9 rocket stage, though the company says that is a goal for 2016.